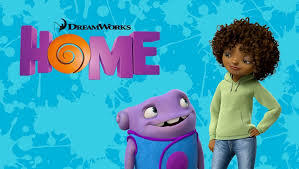 Thursday night we saw Home, the film version of The True Meaning of Smekday by Adam Rex. One of the cable stations was running it over and over. I liked the book a lot, and the movie was pretty decent, mainly because I liked the animation for the main human character, Gratuity Tucci. We're talking a cartoon girl with incredible facial expression and body language. Also, I'd just like to point out that both Gratuity and her mother are attractive females with hips. Cartoon women usually have lower bodies like store mannequins and busts so big they look as if they're going to fall over. For someone who read the book, the movie is interesting because of the changes that were made. I remember the book being a little scarier than the movie, for one thing. For another, Gratuity and her Boov buddy were headed for Florida (DisneyWorld, I believe) in the book. They go to Paris in the movie. This requires the car they use to fly, something that I don't recall in the book. Why Paris? Or, to put it another way, why not Disney? Were they hoping to attract an international audience, one that they expected to prefer a European city to Orlando? The biggest change, though, is the title. Home probably refers to the fact that Earth is home to humans and the Boov were making themselves at home there. But viewers won't know that until they've seen the movie. So how is that title preferable to The True Meaning of Smekday? This book got quite a bit of attention when it was published. By changing the name, didn't the movie makers risk losing the book's fans? I don't know how this movie did in the theaters, but I don't recall hearing much about it in my childlit circle. I haven't seen the movie or read the book, but I will hazard a guess that they changed Disney because it is a dreamworks film and that the Home title is just following the mono-word titles in the footsteps of Brave, Tangled, and Frozen. Hmm. That certainly makes sense. I was wondering whether Boov is a parody of a naive American pronunciation of "Beau" (beautiful person). When watching the movie, it seemed to me that Boovs are uncool, but desperately trying to be popular and cool. The captain is the evil jock dork (he hits people with his staff and thinks he's great), Oh is the nerd dork (he fixes the car). But Paris is supposed to be fashionable, and the Boovs are just ruining it, like everything else, with their uncoolness. Thanks for the reference to the Sylvia Chomet animated film. I'd never heard of it. I haven't watched the whole thing yet. Okay! Let's Read Some Mainstream YA!